Sorrowful news has reached us. The Hero of the Cuban People, Fidel Alejandro Castro Ruz, is no more. The great patriot of Cuba, one of the most outstanding political leaders of the second half of the 20th and early 21st centuries, died at the age of 90. Fidel Castro is the legendary leader of the Cuban Revolution. The name of Fidel Castro is associated with truly grandiose events that shook the world in the mid-20th century. We remember the Moncada barracks, the SierraMaestroMountains and the Bay of Pigs. He was not yet 30 when he became the leader of his people fighting for their liberation. Under his leadership the Cuban patriots accomplished what seemed to be unthinkable. They did not only topple the hated dictator Batista who had turned his country into a US colony, but challenged Washington’s policy. For the first time on the American continent, within 90 miles of the coast of the main citadel of imperialism, there appeared a state that took the course for socialism. Yes, the Cuban Revolution, the rebellious people had a great leader. Castro went down in history as a man who made an epoch, a true popular leader. His ideological staunchness, unbending will, fearlessness and absolute honesty attracted people’s hearts. His energy infected anyone who was by his side. Being the head of state, he never lost strong bonds with the people, breathing the same air with them and feeling with them. These qualities could not but earn him respect. Even his enemies recognized it. Having raised the banner of Lenin and the Great October Revolution, Fidel remained loyal to the revolution throughout his life. It is deeply symbolic that the second part of Fidel Castro’s name, Ruz, which he inherited from his mother, is consonant with the word “Russia.” Inspired by the ideas of the October 1917 Revolution and the achievements of the Soviet State, Fidel became the leader of the main Revolution of the second half of the 20th century, a successor to the cause of Lenin, an heir to the Russian revolutionaries on the American continent. The tiny Island of Freedom riveted the attention of the whole progressive mankind. The Cuban people set a priceless example showing that American imperialism is not all-powerful, that the fearlessness and dedication of communists could defeat it. Those great events have long become a legend. Having taken on board the ideas of socialism, Cuba marched confidently forward. The FreedomIsland gave the world a brilliant example of building a just society that guaranteed free quality education and healthcare, a high level of science and culture. Not possessing any significant mineral riches and caught in the vice of the American blockade, Cuba created a society in which there were no paupers or hungry people and every schoolchild had an opportunity to develop his/her talents. The achievements of the Cuban people became the dream of common people in many countries which seemed to possess greater economic potential. The example of Cuba inspired national liberation struggles of many peoples of Asia, America and Africa. Fidel Castro and his fellow-revolutionaries came to their rescue. Cuba quickly became a moral super-power. It became a leader of the Non-Aligned Movement which included dozens of states. Cuba hosted major international fora. It became a great sporting nation which did very well at Olympic Games. The country’s leader was more and more often referred to in the world as Fidel. His name became a symbol of revolutionary dedication, ideological and moral staunchness. It became a symbol of valiant struggle against the world order which the advocates of capitalist globalization had been seeking to impose on the Planet for decades. During the 60 years since the Cuban Revolution they made countless attempts to “bury” Fidel. His life hung in the balance more than once. He survived many assassination attempts. But he continued to lead his people to the victory of the human spirit, Truth and Justice. He was bitterly hated by the American globalists and enjoyed boundless love of millions of people the world over. He was seen as a symbol of victorious battle for social justice and hope for getting rid of poverty and disfranchisement. After the destruction of the USSR and the world socialist system Castro’s adversaries were sure that socialism in Cuba would not last. They hoped that the country which, owing to the exploits of Fidel and his followers, was known as the Island of Freedom, was doomed to become a mediocre puppet state controlled by transnational capital. But the Island of Freedom stood its ground. It confirmed at the most difficult of times that it deserved its proud name. Cuba did not cave in to the pressure of severe economic sanctions and ceaseless political provocations of its enemies. It staunchly upheld the socialist gains even in the midst of an ocean of anti-communist lies and betrayal. In the direst of conditions it managed to preserve genuine sovereignty and safeguard the first socialist state in the Western Hemisphere, which was the second most heroic deed accomplished by Fidel Castro and his supporters since the 1956 Cuban Revolution. Castro was not only an outstanding statesman, but a great thinker. Proceeding from Marxism-Leninism, he was able, amid the chaos of events, to identify key trends, quickly size up the situation and take the right decisions. Fidel had extraordinary personal charm and at the same time exceptional modesty. All his aspirations were aimed at making happy the life of ordinary Cubans who put their trust in him. He lived up to their hopes. The Soviet Union always stood shoulder-to-shoulder with Cuba in the struggle against imperialism. Fidel Castro was a great friend of the Soviet people, a loyal and courageous ally of our country. For those who lived in the USSR and those who today value justice and independence he will forever remain a close and loved person. Today, the example of the Cuban Communists is particularly important for Russia which has experienced a capitalist comeback. Fidel’s steadfastness and adherence to principle inspire us today as we carry on his cause. Comrade Castro has left us. 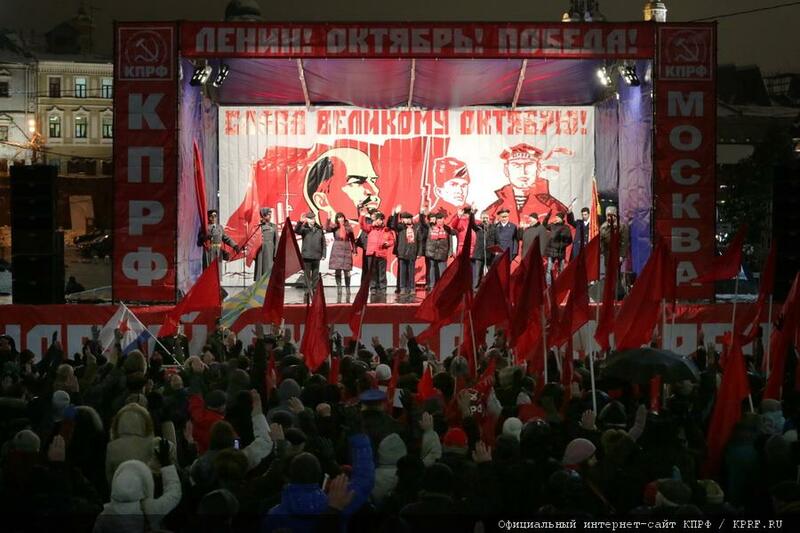 Russian Communists grieve together with the Cuban people. But Fidel Castro has left behind a powerful Communist Party tested in battle and in peaceful endeavor. He left behind the Cuban people which is inspired by the brightest of ideals. He has left behind a memory in the minds and hearts of hundreds of millions of people the world over. The Central Committee of the CPRF expresses its condolences to the people of free Cuba, to the relatives and close ones of the Comandante. We hope that the Island of Freedom, even after his departure, will stand its ground, will remain loyal to the socialist principles and will adhere to Fidel’s heroic cause. In the cohort of great champions of the cause of socialism the name of Fidel Castro Ruz will forever stand side by side with the names of humanity’s greatest revolutionaries. The sun of freedom will shine over Cuba. This entry was posted in Statements on November 28, 2016 by International Department. 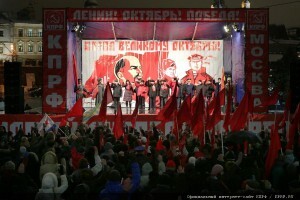 On November the 7th , the procession and the meeting dedicated to the 99th anniversary of the Great October Socialist Revolution was held in Moscow. This entry was posted in Statements on November 9, 2016 by adm.